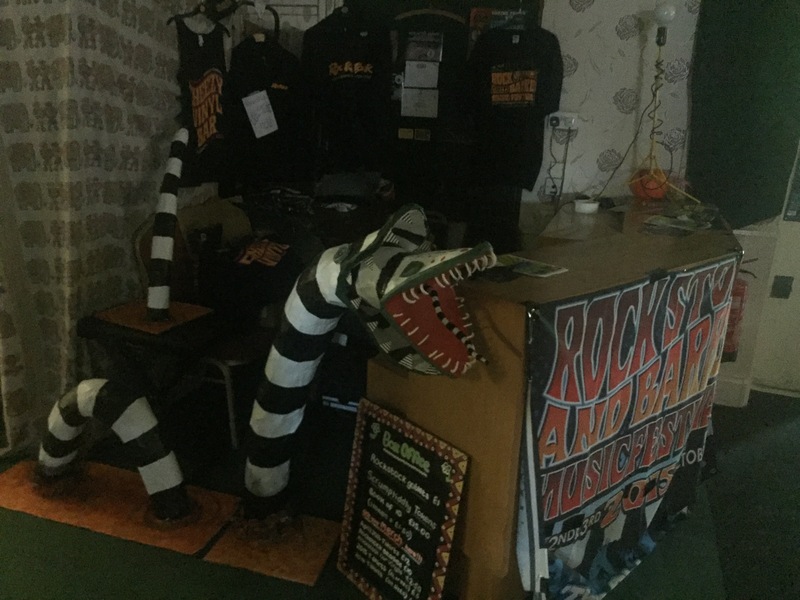 Rockstock and Barrel is fast becoming one of my favourite festivals – to take what is, frankly, a somewhat tired old social club attached to an abandoned power station and sprinkle it with imagination, art and music is a real testament to Debbo, Phily and their ever-expanding team of helpers. This year the them of the festival was Tim Burton films – the decor and fancy dress were the magic dust on top of a solid foundation of facilities and great acts. I’d dumped Ludo on the site on Thursday night, but alas work commitments meant I couldn’t stay – arriving back on site on Friday afternoon – complete with some shopping for Tim and, perhaps most randomly, a watering can for Lynne and Ian (which looked alarming like some kind of thing you’d find in Ann Summers!). First order of business was to get the van sorted out – and then get my mits on the first of many Pineapple ciders. 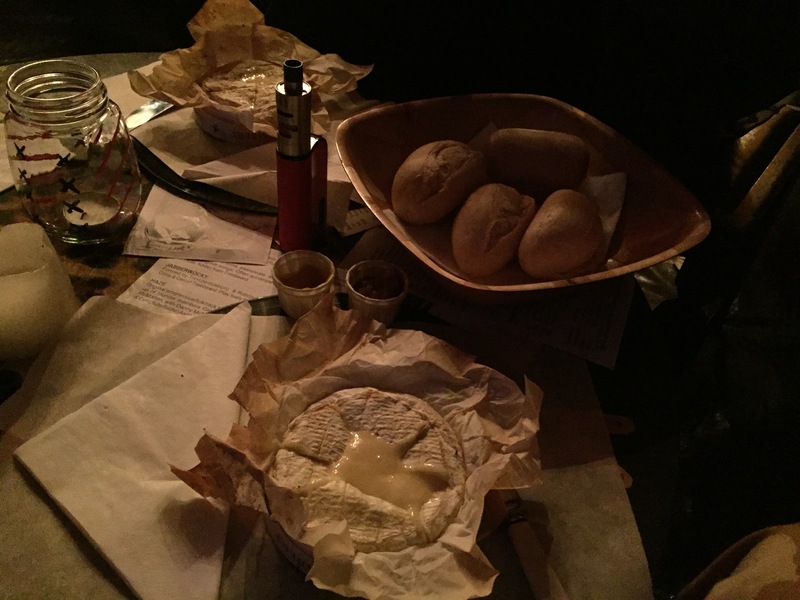 As well as organising superb venues, decor and entertainment the stand out feature of Debbo and Phily’s events are their wonderous array of ciders and wines – and of course the Cheezy Vinyl Bar, which even had the option of pre-booking a baked camembert too. 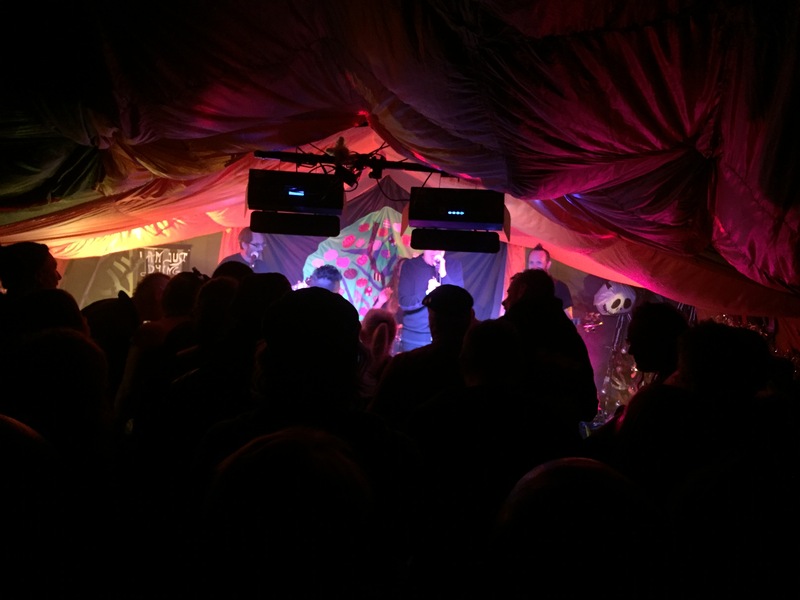 The main stage was in the social club, the cider bar hosted the second stage and a third was nestled in the attached Cheezy Vinyl Bar. Add to that The Purrple Peeple Eater hosting four Rockstock and Personal sets that revellers had bidded for, and space for drum workshops, didgeridoo workshops and the DoozerBird Lounge with yet more art and music on offer – and you’re really properly spoilt for choice when it comes to spaces to relax, eat, socialise or just absorb the creativity of your surroundings in either visual or aural form. 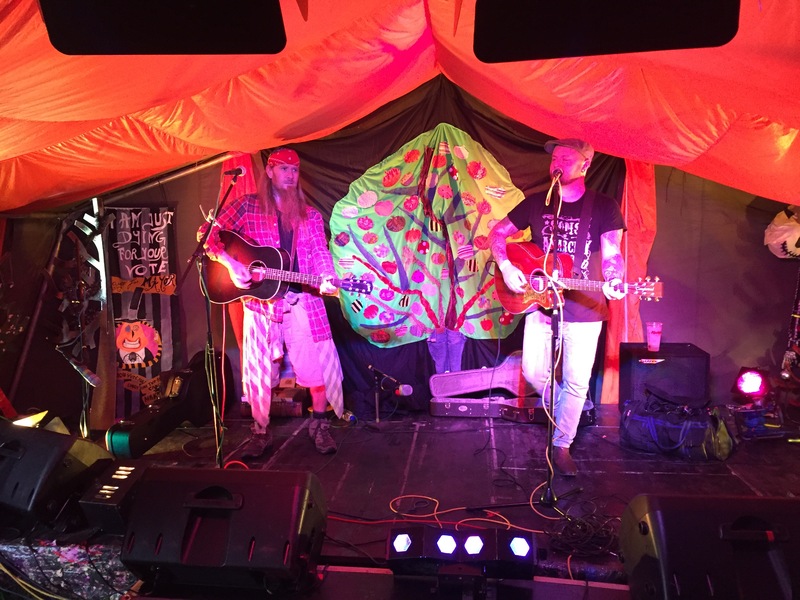 The first music of the day for me was in the main stage – I think they were called Omnivibes, but the cursory search on Facebook found a couple of bands that didn’t look to be the ones I saw! 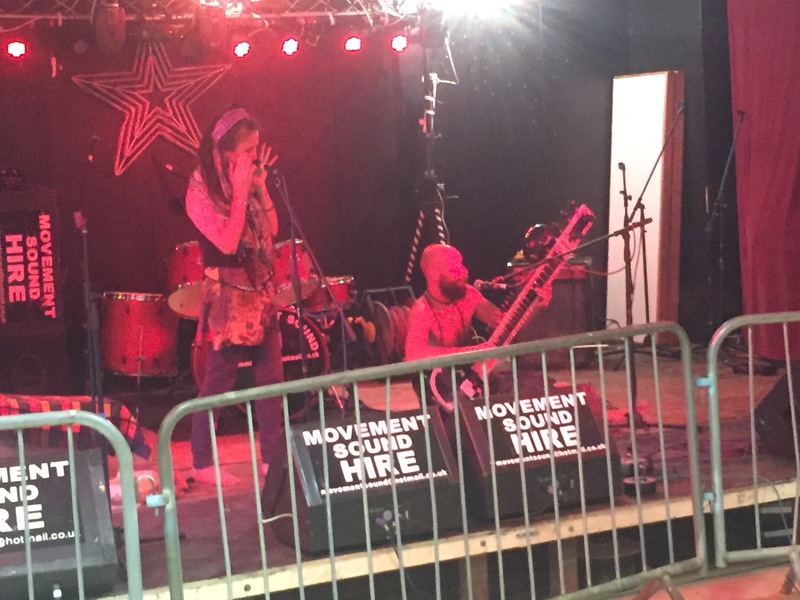 A duo comprising Sitar, an Asian wind instrument and vocals – it was mesmeric, the perfect way to start a festival whilst I was munching on a gammon cob (delicious, and great value too! ), although it would’ve even better if I were munching on a curry instead! 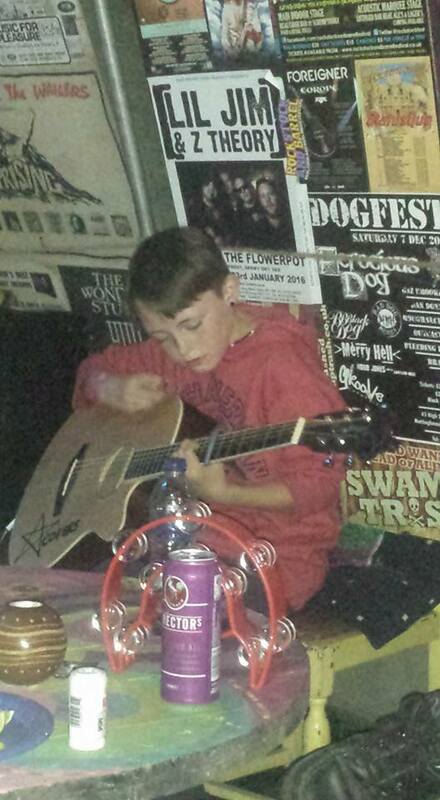 Over on the acoustic stage Infamous Recluse, also conspicuously absent on Facebook, struck up. 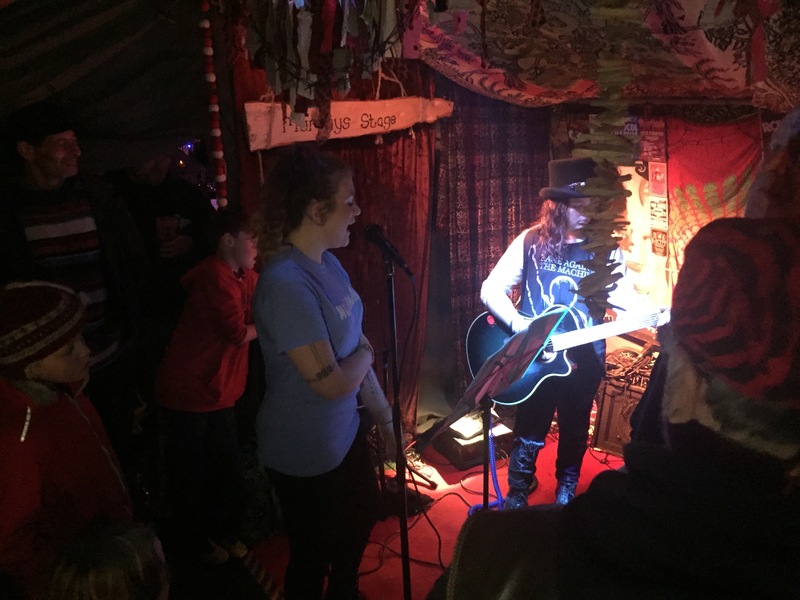 They’d only been together a couple of weeks (probably explaining the lack of Facebook page) – a nice sounding acoustic sound, songs included Inside the Music, Loving Her Most and All Night Long that semi-disappointingly wasn’t a tribute to Lionel Ritchie! 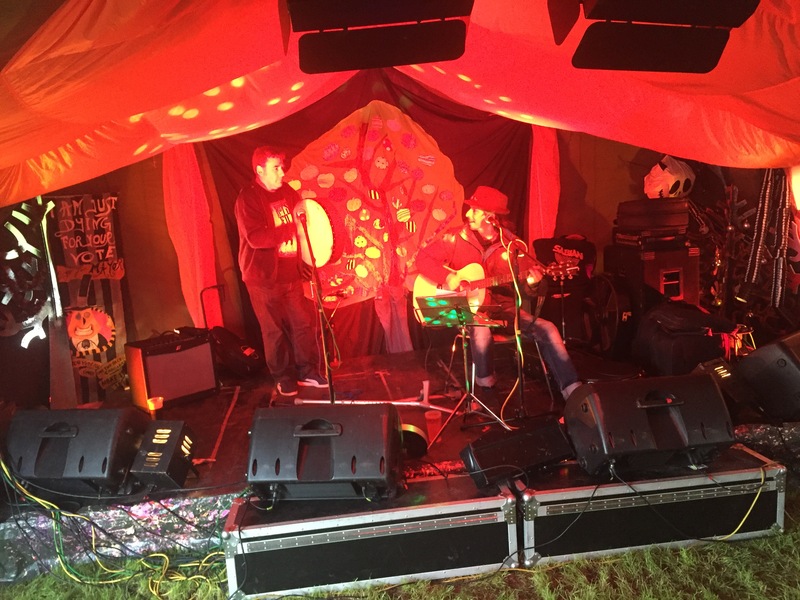 After these guys had finished up Jonny Wallis and Maty from Folk The System started sound-checking although a few technical wibbles took over. Which was good in a way, as we wandered into the main stage in time to catch a bit of ‘Doozo’ – aka Zoe Brilliant and Doozer McDooze – Zoe was singing Summer of ’69 as we walked in, then Doozer chucked his interpretation of Pulp’s Common People into the mix. I think the next song was called Heart As Black As Any Crow with Zoe back on vocals, then a singalong rendition of Queen’s I Want To Break Free. Fun set, well delivered! Meanwhile Jonny was back on the acoustic stage – we caught The Boatman and a new song that he’d not given the name of before being distracted by the awesome drumming workshop going on amongst the stalls, we watched from Caroline’s spanking new gala shelter for her to sell jewellery and clothes from – it looked great, and had the bonus of Murphy to give fusses too, plenty of good reasons to be visiting Mystic Blue should you encounter it on the festival circuit. 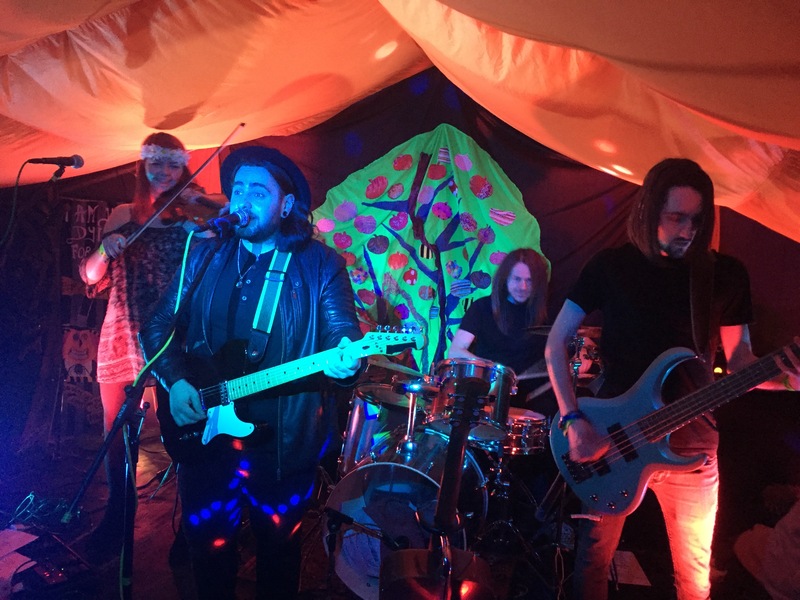 Brad Dear was next up for us with his full band – Lizzy again joining to add violin and backing vocals which frankly really filled a gap in their sound that none of us had realised was there before! 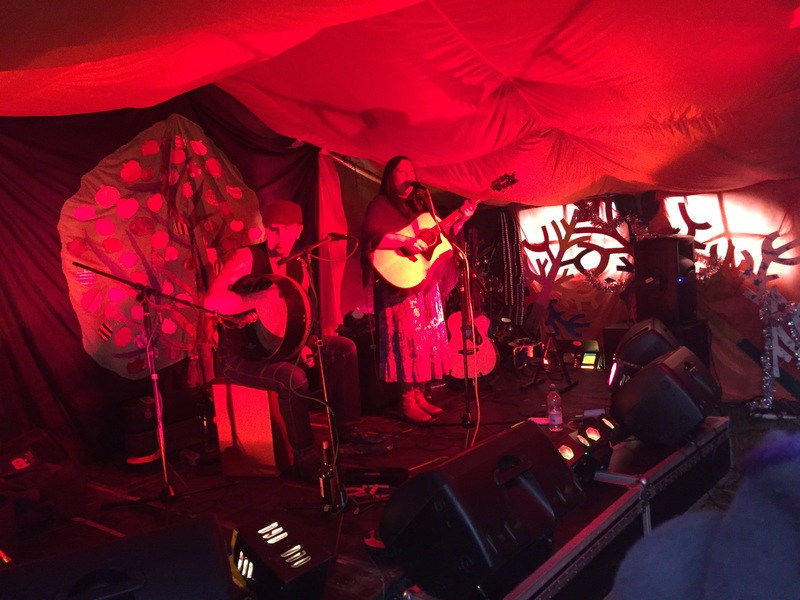 Circles and Roundabouts kicked off matters then Walls, Leave It All Behind, Festival Bar Blues, So Far Away, Long Road Home, The Only Road I Know, They Say (Lizzy’s pick up fell off her violin at this point – most professionally dealt with though!). All these songs are so familiar but now with the added fiddle flourishes and backing vocals take on a whole new life of their own, I’m looking forward to the imminentish EP they are apparently working on! Special Brew kicked off a conga line, led by Ferocious Dog’s John, and the set was finished up with Billy Brown, I’m Still Here and an encore of Save Our Souls. I’ve always loved watching Brad’s band evolve over the years – but now there’s something that I might approximate as a finished article on offer I think. Once a bit of socialising was done it was time for Funke and the Two Tone Baby over on the main stage. He’s announced now the pre-order of his live/not-live album – effectively incapsulating this year’s festival set list in a recording but done ‘live’ – similar to Gaz Brookfield’s Solo Acoustic Guy recordings – can’t wait to hear it, I’ve got mine pre-ordered, I hope you have too! If not, you can do it by clicking here. The set list was kinda familiar, but with some bonus stuff thrown in too – Never Used to Dance got the feet moving from the off, Bella’s Kiss strangely more disturbing since discovering its true inspiration, I’m Not Well and then Anchor – one of mine and Ella’s soppy songs, so it was a bit sad she wasn’t there ’til the next day. If You’re Nice To Me then kicked into a new song that I didn’t catch the name of. We were dragged through to the end of the set by more familiar numbers – Medicine for the Soul led into Not Enough Bonobo which brought what seemed like an all too short set to a close. Loud calls for an encore were demanded, which was delivered with a rousing cover of 54 46 That’s My Number. Funke never fails to deliver – I’m excited to hear the new material he’s been working on though! Then my Friday went a bit awry – as Hung Like Hanratty were oi-punking their way around the second stage I popped back to my van to top up on e-liquid. The temperature had dropped, the van was warmer, I thought ‘I’ll just have half an hour before The Black Tartan Clan and then Dirty Davey‘ – then woke up several hours later when everyone was already in bed. Disappointing in the extreme, but well, it gave me the chance to get a good night’s sleep I guess! 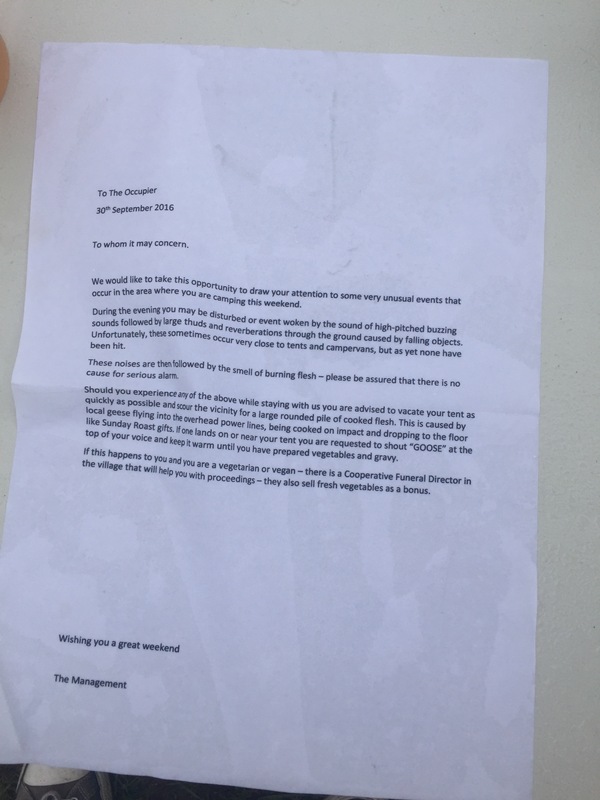 Come Saturday morning a series of amusing letters had been left ‘To the occupier’ of the vans, caravans and tents. 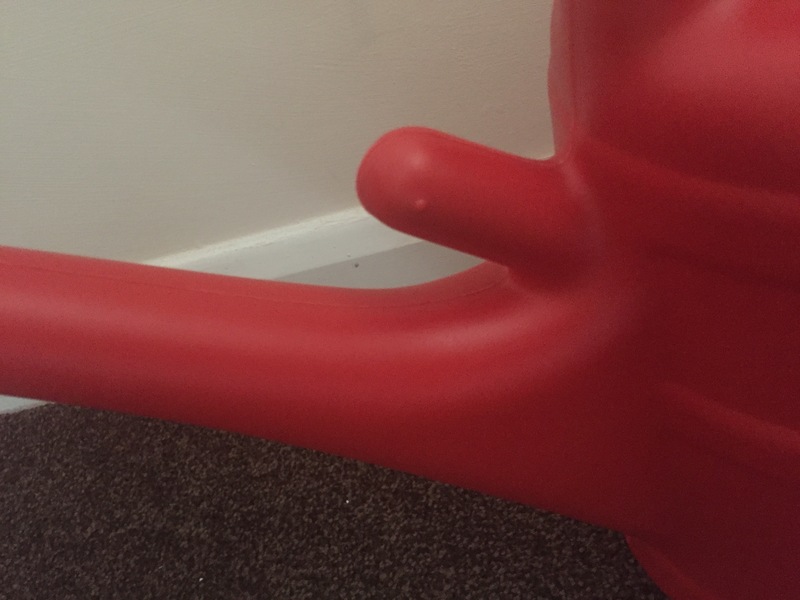 I grabbed a photo of mine, it made me chuckle a lot! There were a few different variations knocking around – upon quizzing Phily and Debbo about them they had no idea about them, so an imaginative festival goer with too much time on their hands should take a big bow for bringing much mirth to some hungover folk! 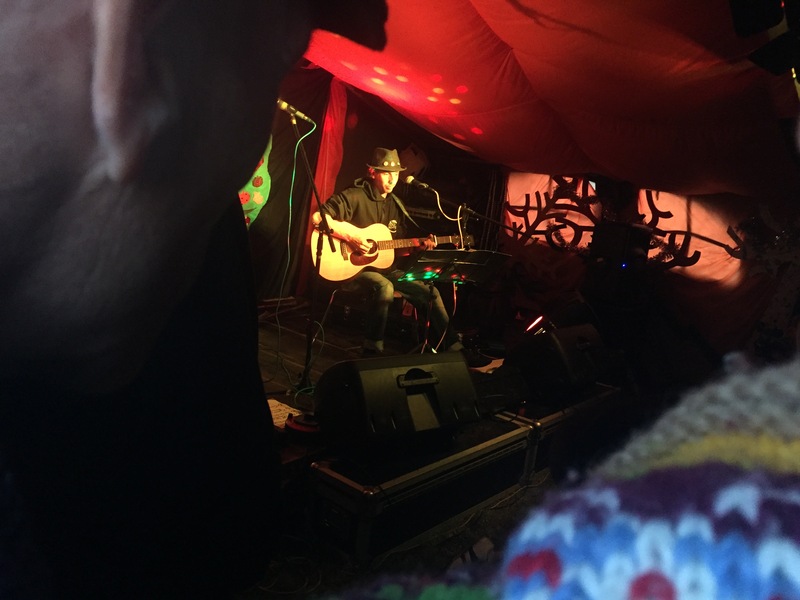 More pressing matters though – I’m not sure if I mentioned it on here before but a drunken conversation at Wistful Festival saw me conscript myself as percussionist in The Star Copiers. I duly got myself a cajón and started joining Mark and Kev for rehearsals – I’m definitely a beginner, but I’ve been enjoying it and plan on learning more. With Kieron stepping down as singer we’ve also recruited Jacquie to provide the vocals. 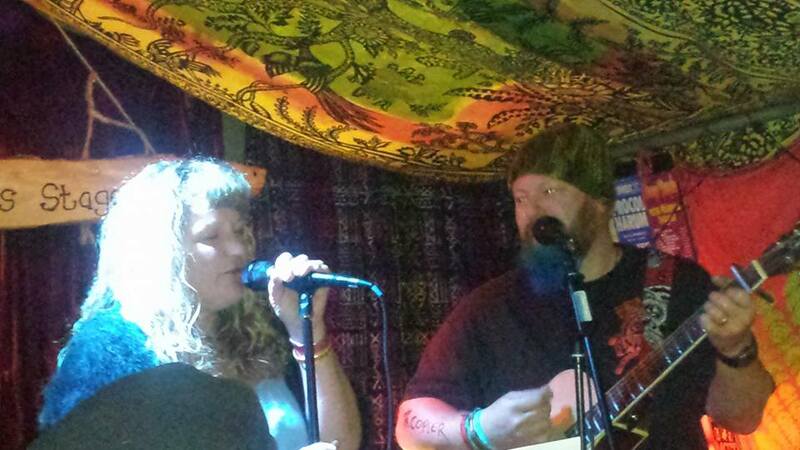 This was our first gig, having kept Jacqui as a surprise to all but a few folk. The Carrot Spies (ed: we were due to appear as The Carrot Spies on Friday evening, but ended up as Issac and The Star Copiers on Saturday morning instead) new line up including multiple guests spots. With a pleasant surprise, to me at least, Jacquie on vocals, and Alan on cajón. The newly established breakfast club drew a great crowd too. There was no messing about and no need for intros, and a strong opener, no signs of any nerves either for their maiden new line up outing – Mad World – by Tears For Fears, then Jacquie makes way for a Dave Savage and Kev duo and a nice little singalong of Ferocious Dog’s Criminal Justice, not sure if it was Kev’s nerves or he struggles to curb his love and enthusiasm for the tune, but Kev beat Alan’s timing (twice) to the 1234’s – and to coin the adage the third time worked a charm.. (ed: we did it on purpose ‘coz we thought it was funny, haha!). Next up was Jacquie again and Good Riddance by Green Day – a welcome familiar tune in The Star Copiers set list. A bit more juggling around with mics and room on the small but beautifully intimate stage in The Cheezy Vinyl Bar and FD’s Ken joins the lads for Slow Motion Suicide – a song we’re all familiar with and my new favourite FD song – with no sign of Dan for the fiddle solos Alan and Mark proved their musical prowess with a bit of multi tasking on kazoo. I only had time to stay for one more tune as I was still in my crocs and socks and in desperate need of water – so I stayed to see Jacquie back up for The Levellers’ 15 Years, another opportunity for a Cheezy Vinyl singalong… all that’s missing is a roaring campfire in the middle of the Cheezy Vinyl Bar and I’d happily while away the hours…. smoked cheese it’s the future… (ed: we finished up the set with Green Day’s Basketcase and Ferocious Dog’s Too Late with Issac on guitar). 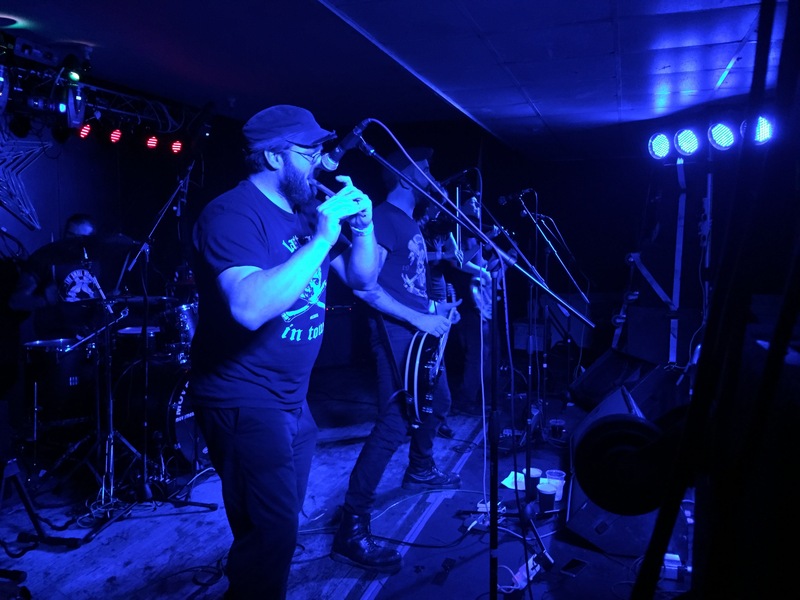 It was pretty exhilarating to actually play a set at a festival – Jamie’s promise of bringing tequila to bookend the set was delivered with aplomb (was there ever any doubt? He also provided the kazoo Bart mentions too) and it was great to see so many people get up early to watch us, you’re all very lovely to indulge us so! My cajón survived too, despite being held together by gaffa tape after a particularly raucous rehearsal! 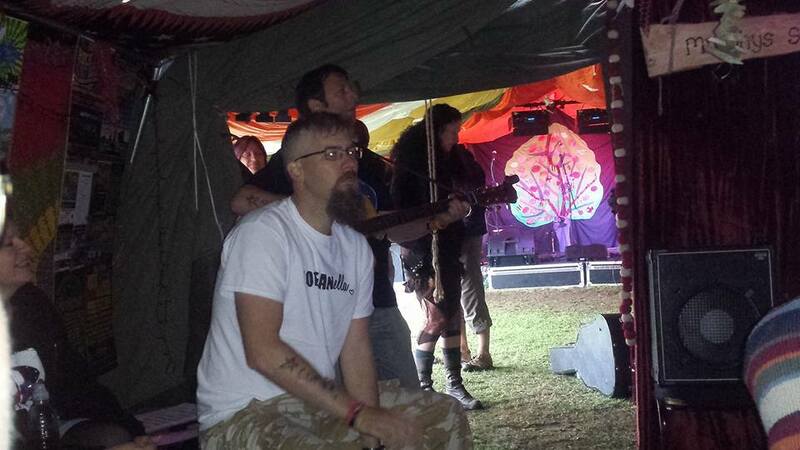 Our mentors, heroes and inspiration The Star Botherers were on straight after on the second stage. They kicked off with Just Around The Corner – one of my favourites just because it’s so lyrically clever, My National Trust kicked in with some technical wobbles – and carried on once they were resolved. It elicited a loud response from in the tent and without too about just how much people are prepared to pay for condiments that go on toast! Above anything this set made me think how many songs they’ve amassed – Star Wars Bride has fast become a classic, Ringing In Sick is still new to my ears but increasingly familiar whilst it was great to hear Hubball Shuffle get an airing – I’ve not heard it for a while, Blind Fever Band were due to play but sadly had to pull out due to an injury, so it was a nice tribute! They finished up a fun set with First Night Festival Fever (quite apt for me!) and of course Bad Guys to finish off an awesome set. 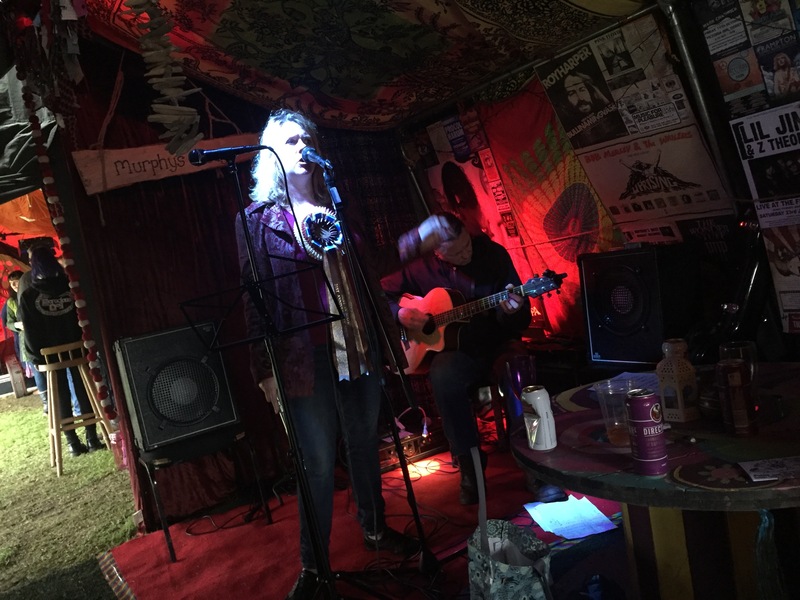 Next up was a bit of festival wandering time, in between nattering with countless folk I took in a chunk of Honeywitch in the Cheezy Vinyl Bar – I think the first song I heard was Wild Horses, then followed up with cover versions of Joy Division’s Love Will Tear Us Apart and Remember You’re a Womble. After the set Clare was adamant her timing was off as she’d struggled to hear Adrian’s guitar timing. It wasn’t something I’d noticed (but then I was a few ciders to the good by then!). 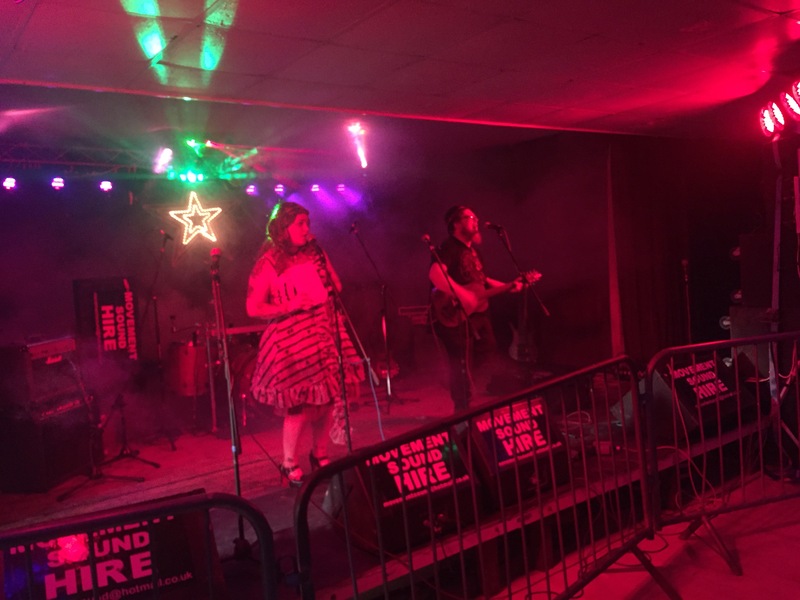 Emma & the Professor were weaving their enchanting sound around the acoustic tent – Kisses Sweeter than Wine kicked off the set before we had to pop and grab Morgan’s gear from the car so that Nick could go and get checked into their hotel. Next on the main stage we caught a bit of The Eskies – funky energetic folk, Tear Along the Line and Down By The River were the two titles I managed to grab of the half dozen or so songs we saw. Via a trip to the bar I encountered Treebeard playing what sounded like a mediaeval kind of folk, as I popped my head round the corner they were just finishing up. A pity, it sounded good! Back at the main stage The Eskies were finishing up with Fever and another song I missed the title of. 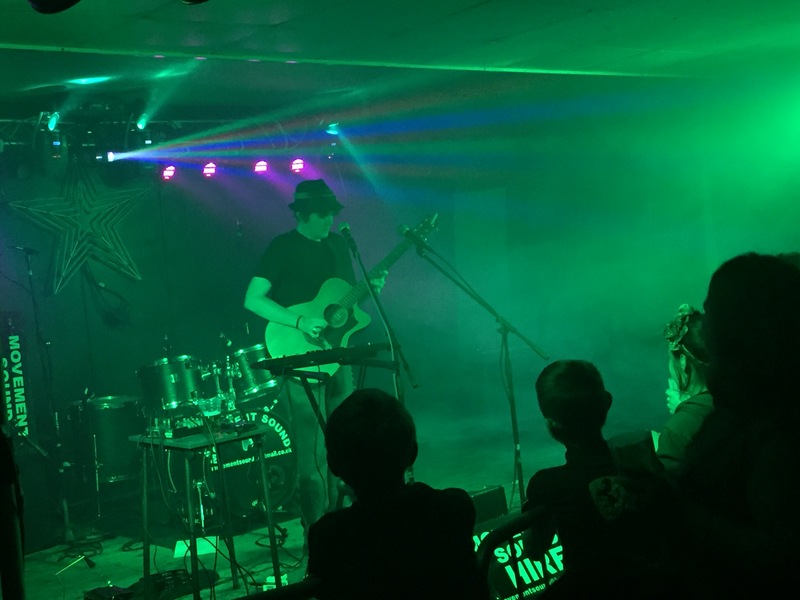 They are really developing their sound and stagecraft each time I see them – definitely ones to watch out for! Folk The System were next on the second stage – the heavens had opened, which whilst not ideal didn’t detract from the fun (certainly not for Naomi who was dancing around in it), and made the second stage tent nice and snug! They are another band who get tighter and better each time I see them – Civilisation kicked off the set, then one I missed the title of before a riproaring run of Environmentally Friendly, Death of a Nation and Street Corner People with Clacka demonstrating his signature dance move on stage. At this juncture I needed to nip away to the van to wake up Ella in time for a last minute rehearsal for her and Morgan. Truth be told, I didn’t do very well, I too had a power nap only for us both to be woken up by Morgan half an hour later, haha! I left them both to have a run through of their set list in the van and wandered back to the outdoor stage – and I’m really glad I did. 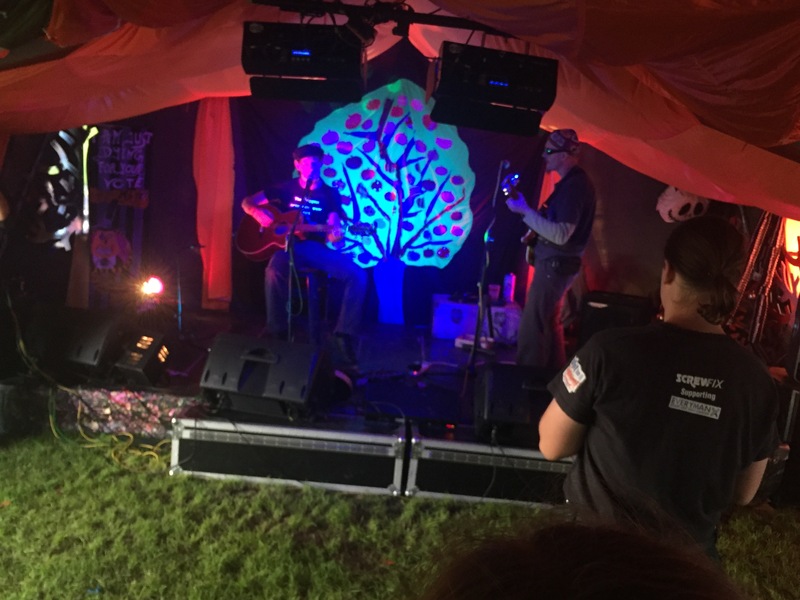 One of my favourite sets of the weekend was delivered by We Steal Flyers – two chaps with guitars, both singing either individually or harmonising. They opened up wiht The Lost Boy by Greg Holden – for fans of Sons of Anarchy you might know it as the song from Opie’s wake. Nizlopi’s The JCB Song was awesome too – mashed up into I Wanna Dance With Somebody towards the end. Some original material too – one about chasing applecarts which sounded great. The remainder of the set was an eclectic selection of cover versions – Redemption Song, Sit Down, I Got You Babe and Show Me The Way To Go Home – there was just something about the performance that really grabbed me. Melodic, tuneful but layered with fun too. I wish I’d thought to grab a CD or two from them now – but generally I don’t pick them up at festivals through fear of losing them or them getting wet or snapped. D’oh. Excitement mounted for us as time ticktocked around to when we’d booked a baked camembert each – we found ourselves a table in the Cheezy Vinyl Bar and enjoyed the gooey goodness with fresh bread, pickles and chutneys. It seems like such an obvious idea, but I’ve never seen it before at a festival – it’s amazing! We also had the bonus of Phat Bollard providing the soundtrack over in the Scrumptiddly Cider Bar. I was a bit too cheese-distracted to note what they played though! Still in the Cheezy Vinyl Bar and it was time for Morganella to perform – I know I’m terribly biased, but it was to my ears a spellbinding set. KT Tunstall’s Black Horse and the Cherry Tree works really well for Ella’s voice, then a real change of style of Paul Weller’s Wildwood. We didn’t have the doorbell to chime for Smashing Pumpkins’ Disarm (which is undoubtedly an improvement!). A slow version of Gaz Brookfield’s Black Dog Day started acapella before Morgan layered in his guitar – it worked really well. 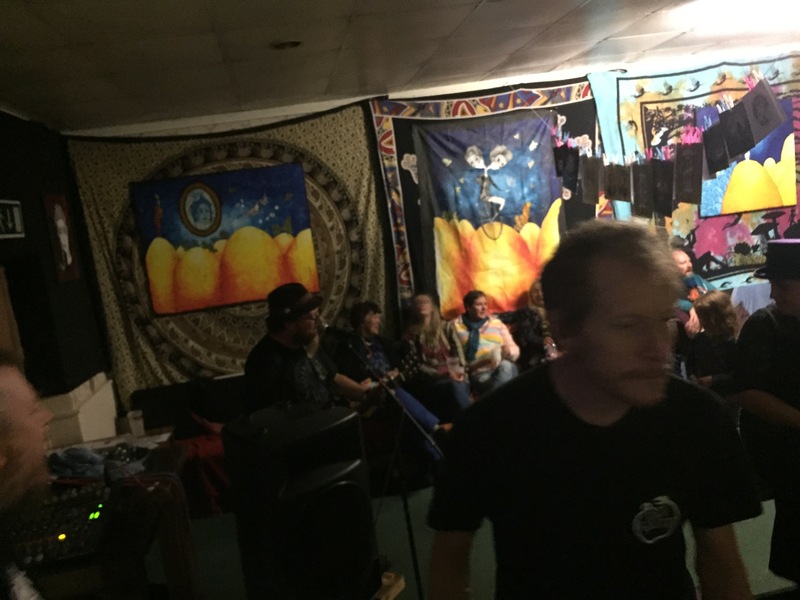 Of course it wouldn’t be a Morganella set without a Leylines song – Run For Cover had the crowd singing along before a return to Gaz with Bigger Man (with accompanying table percussion from myself and Dave, ha!). They finished up with Frank Turner’s Photosynthesis – handing out lyric sheets to the crowd along with instructions to crouch down and jump up and go crazy at the appropriate moment. There was a pretty good participation level too! Headsticks were next on the second stage – kicking in with World Away and then Paper Flowers – they were on typically energetic form, one of the most engaging live acts out there at the moment for my money. Nearly all their songs become anthemic over time – not least Cold Grey English Skies, Fanatics, What Do We Want – it’s relentless! We had a bit of packing up of Morgan’s stuff though, so nipped to the van with that before heading back to the main stage. 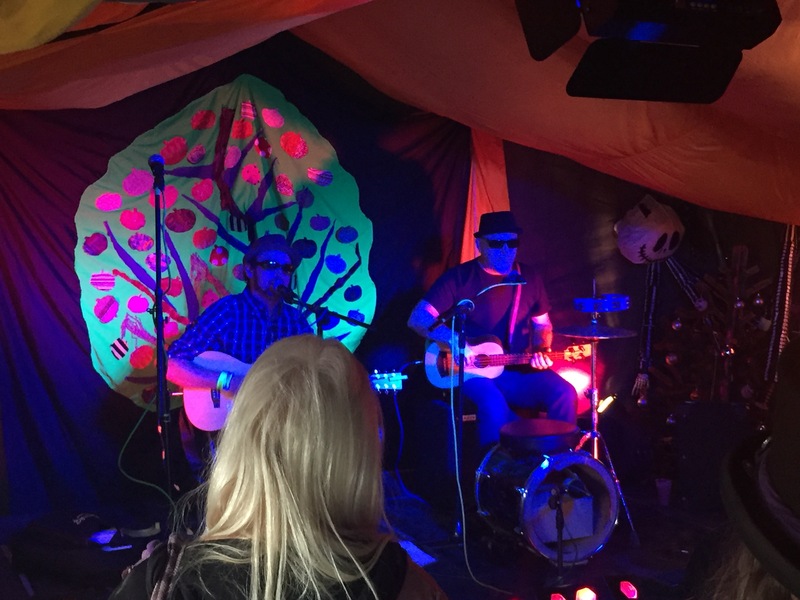 The Lagan were up next – another superb act, already mindful of conserving energy for the final act we sat down and had a natter with Mick and Joe, resisting the not inconsiderable urge to go and have a dance. Star of the County Down was in there early doors and had feet tapping round our table, then Home For A Rest. I think the next song is called Jim, I might be wrong, then there was another before we headed out to grab a good spot to watch the next act on the second stage (it was going to get snug in that tent!). 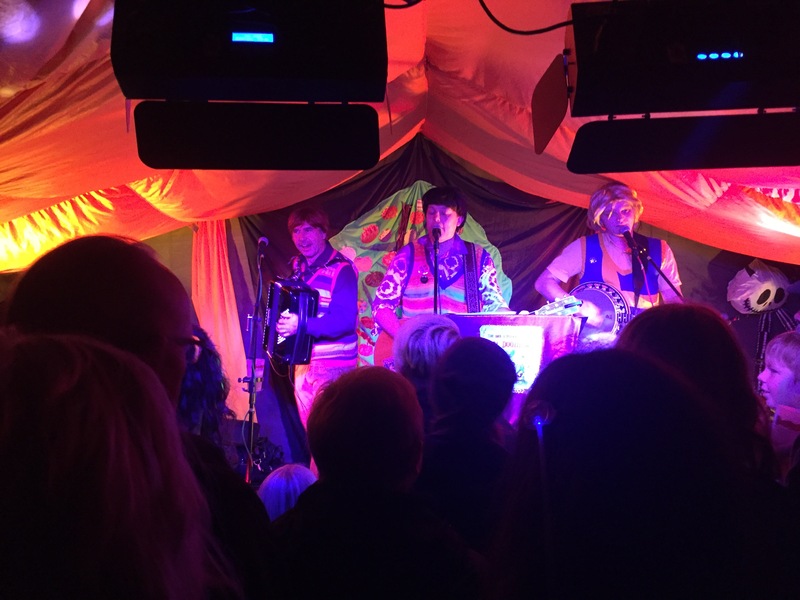 The Bar-Steward Sons of Val Doonican have a new intro recording – they kicked in with Bar Steward Bop and in playful mood went for the crowd participation Lottery song. 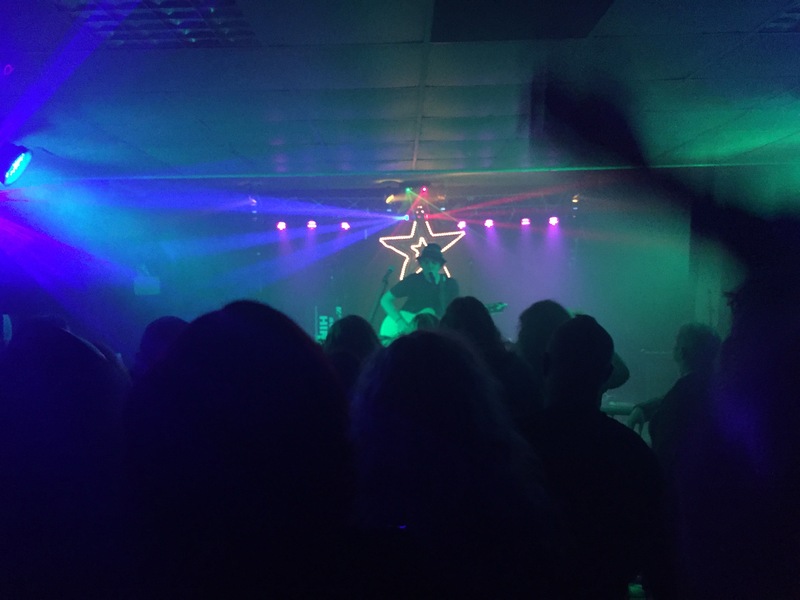 Next up was You Gotta Fight for your Pint in Barnsley – that was never a problem at Rockstock, the booze flowed very quickly every time I went to the bar! Massage In A Brothel was next and then a presumably re-lyricked version of Travis’ Sing was unleashed as we escaped the throng to get inside. 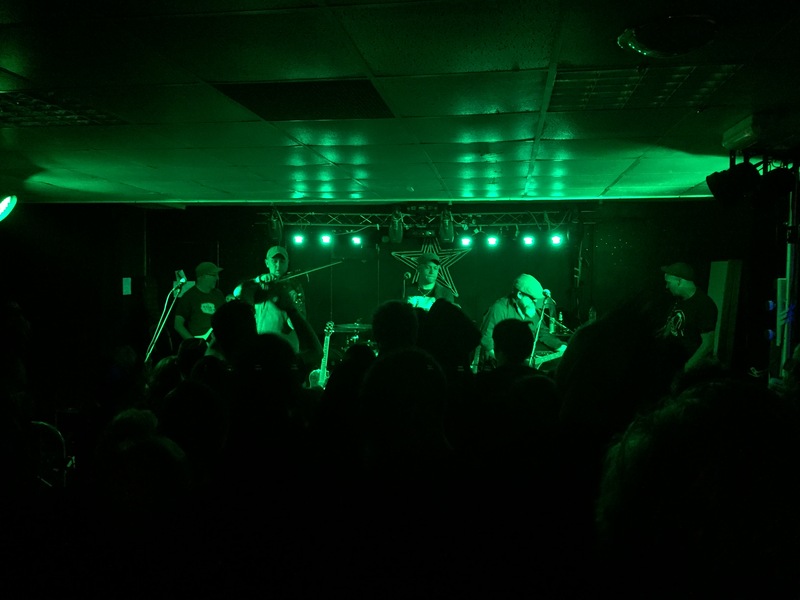 Headlining was Ferocious Dog, of course – still an exciting prospect for me. Unlike my occasional back-seat observations of late I was well up for a mosh for this one, which means the set list is – well – absent from my mind! Haha! Certainly Gallows Justice and Poor Angry and Young opened as is customary. Crime and Punishment was definitely in there giving us a chance for a bit of line dancing in the moshpit – a very lively one, it has to be said! Other highlights were Sophie’s didgeridoo layers on the expanded intro for Lyla, people directing Paul away from the ceiling fans when Nicki was up on his shoulders for Too Late, the first time I’ve ever seen a surfboard held up whilst we were kneeling down to enable Dean to surf for Freeborn John. 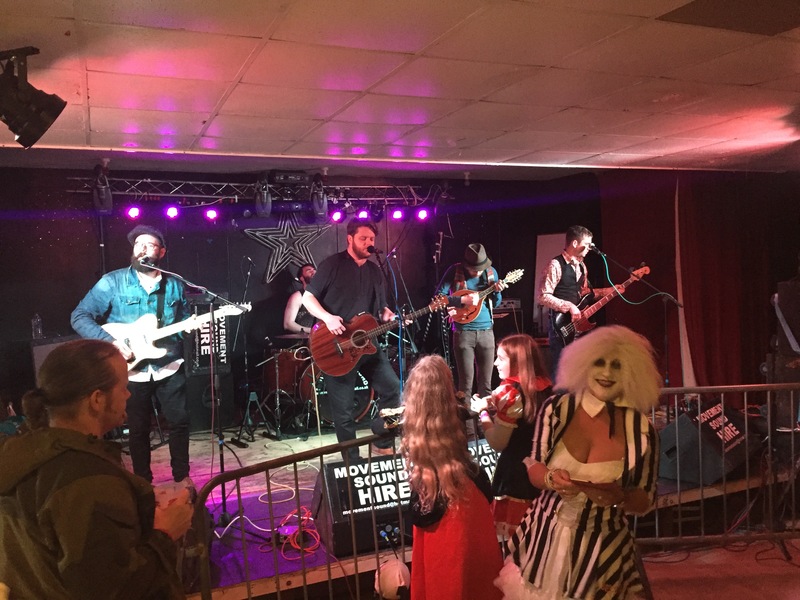 It was a barnstorming set – the boys are on good form, as you’d hope with some pretty substantial touring looming on the horizon and on the back of a busy festival season! An encore was loudly called for and delivered with Slow Motion Suicide – of course. An epic way to finish off a set. 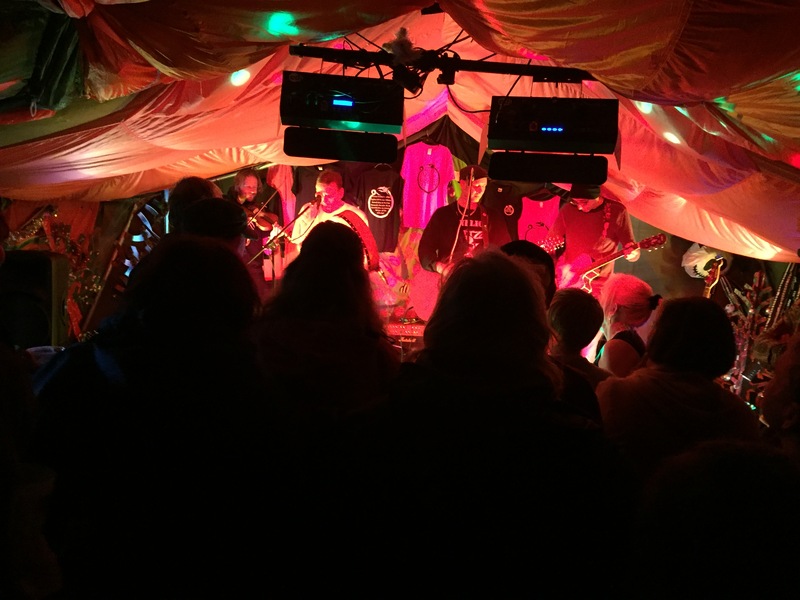 After a bit of decompressing, taking on liquid and generally exulting in the post-Dogpit buzz we hung around to watch the start of Doozer McDooze‘s set in the DoozerBird lounge, but tiredness gradually won out and we wended our way back to the van for a well earned sleep. A wonderful festival from start to finish, delivering everything it promised and more! Come morning clear-up was already underway – the wonderfully imaginative decorations – many made from papier mache – hadn’t fared well in the rain so many ended up on a bonfire, quite a sad sight! Nick – who is a hero – took Ella back with him and Morgan which saved me a customary long Sunday drive. That left me free to help tidy up the site after packing the van up, and be treated to a Sunday dinner which was a lovely way to round off the weekend with all the folk who’d made the festival happen. And despite the amazing time I had, I can’t help but kick myself over missing bits and pieces – the Rockstock and Personal sets we’d originally planned to film so I thought I’d see them anyway, but as that plan fell through I opted not to bid for them to give others the chance since I’d seen all of April’s ones – the feedback from those who attended was awesome though. And sleeping through Black Tartan Clan and Dirty Davey rankles a bit. But you can’t see everything! 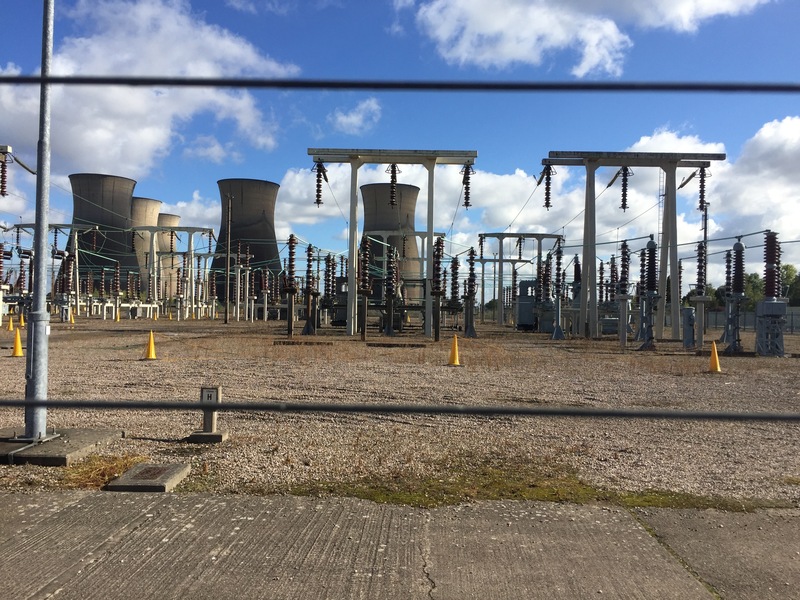 I’ll gloss over dropping my phone and smashing the screen taking the picture of the cooling towers having spoted the ‘this fence is electrified’ sign rather too late!